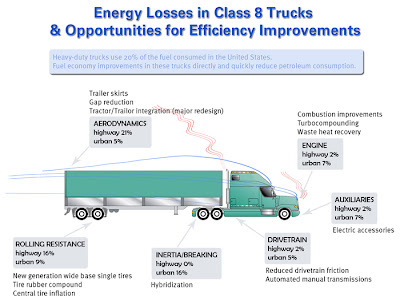 fuel for thought: Natural Gas Range Anxiety in Long Haul Trucking – Real or Perceived? Natural Gas Range Anxiety in Long Haul Trucking – Real or Perceived? Fuel economy, the distance a vehicle can travel per gallon of fuel is only one piece of the puzzle; the other is range. Range is how far a vehicle can travel before you need to refuel, when it’s carrying a full load of fuel under average conditions. Most people attribute the range of a vehicle solely to the engine: the common misconception is that range is determined by how much fuel the engine burns. But range isn’t simply calculated by the engine’s thermal energy. Many aspects of the vehicle influence its fuel economy, such as: vehicle aerodynamics, vehicle load, terrain, driver habits, and more. This diagram shows some of the factors that contribute to a vehicle’s range, and the opportunities for improving those areas. When all else is kept the same (such as load, terrain and surroundings), the Westport HD engine achieves approximately the same fuel economy as its diesel equivalent. Many fleets initially object to new technologies for a wide variety of reasons, many of which can be resolved with simple clarifications of fact versus what their perception may be – range anxiety, especially for heavy duty transport applications, is one of these. Simply put, all motorised vehicles have range limitations. Whether it’s gasoline, diesel, natural gas, hydrogen FCV, electric or even nuclear! A common comment we hear from fleets is that natural-gas vehicles don’t carry much fuel, therefore they can’t travel nearly as far as their existing diesel fleets. This is false. Heavy LNG vehicles can carry as much as 600 to 700 miles of fuel onboard. Surely drivers will need to stop for a break before they drive that far! Heavy CNG vehicles commonly carry 300 to 400 miles of fuel, which is still enough to travel the distance they achieve with diesel or gasoline. The main issue causing range anxiety is that with diesel, the accepted practice is to carry enough fuel to last several days worth of driving. This reduces the amount of time the drivers need to stop and refuel at stations that are not affiliated with their fleet, which are often more costly. There is a simple solution – plan your routes differently and arrange your fuelling stops to coincide with the limitations of the vehicle’s onboard capacity. Although this may seem like a significant undertaking, in many cases it is not. Most large fleets already employ very sophisticated fleet management software that can easily provide the tools to plan routes for a comparable natural gas vehicle. This is a small price to pay given the significant economic and environmental benefits offered by operating on natural gas. When given the choice, a simple operational alteration in exchange for lower operating costs, lower emissions and the pride of running on domestic fuel seems pretty simple. Range limitations occur with any vehicle. The best way to cure range anxiety is to ensure that for all possible travel conditions (weather, terrain, speed, etc.) drivers have enough fuel to complete their journey. If the route will be longer than the truck’s range, then it’s easy to coordinate the driver’s breaks with CNG fueling stations, just like you would with diesel or gasoline. Very interesting and informative article. Natural gas which is the same gas that you run in your home to heat your water heater. This gas has a lot of benefits for your car as you can have a truck engine run almost 500,000 miles which is the average for CNG engines. Very nice work. It is beneficial to many people. Vehicles that use compressed natural gas (CNG) or liquefied natural gas (LNG, glimpsed here) can offer significant savings over those that run on regular or diesel petrol, making them attractive to businesses that operate motor truck fleets. cng tanks for sale for vechile purpose. Its really informative, some facts and other points given here are quite considerable and to the point as well, would be better to look for more of these kind for efficient results for your field of business.